James Francis Ivory was born in Berkeley, California, on 7 June 1928. In 1933, his family moved to Oregon, where his father had bought a lumber mill, but Ivory later returned to California to join the USC film school. His first film, a history of Venice through its art, was made as part of his MA thesis. Its successor, a short documentary about miniature Indian paintings, brought him into contact with the Indian producer Ismail Merchant when the latter attended a screening in New York. The two formed a production company, Merchant Ivory Productions , "to make English-language films in India aimed at the international market." Filming on Ivory 's third documentary was interrupted by the opportunity to make his first feature with Merchant . They persuaded Ruth Prawer Jhabvala , a German-born, English-educated writer of Polish-Jewish extraction, then resident in India, to adapt her novel The Householder. She became their most frequent collaborator, writing or co-writing twenty of Ivory 's twenty-five features to date. The partnership and close working relationship between Merchant , Ivory and Jhabvala has lasted for over four decades, making it more than usually difficult to isolate the director's contribution to each project. The Householder (India, 1963) is rather an uncertain debut, awkwardly staged and stiffly acted, but it was picked up for distribution by Columbia , earning the company enough to finance its second film. Shakespeare-Wallah (India, 1965), inspired by and starring an Anglo-Indian theatre repertory troupe ( Geoffrey Kendal , his wife Laura Liddell and their daughters Felicity and Jennifer Kendal ), is a far more assured work. It introduced a recurrent Ivory / Jhabvala theme: the mutual fascination and incomprehension between people of different cultures. The low-key, intimate-realist style of these films suggests the influence of Satyajit Ray , and indeed Ray helped edit the first and composed the music for the second ( Ivory also used Ray 's regular cinematographer, Subrata Mitra , for his first four features). Their warm critical reception and modest commercial success established Merchant Ivory 's international reputation. Ivory next made two films about the then-fashionable search for spiritual enlightenment by European visitors to India. The Guru (US/India, 1968), backed by Twentieth Century-Fox , cost more than ten times the budget of Shakespeare-Wallah , but suffers from the miscasting of Rita Tushingham and of Michael York as a Cockney pop star. Bombay Talkie (India, 1970) is part tragic melodrama, part satire of the popular Hindi film industry. Neither was successful, critically or commercially, and Ivory 's next three full-length features were made in America. Savages (1972) is a stylised allegory of the rise and fall of civilisation, which Ivory described as "a kind of Hudson River Last Year at Marienbad ". The Wild Party (1974), based on a narrative poem about a silent film comedian's fall from grace with the arrival of sound, was much re-edited by its distributor on first release, and only later became available in a 'director's cut'. Roseland (1977) is a gently melancholic portmanteau, telling three short stories set in the eponymous New York ballroom. 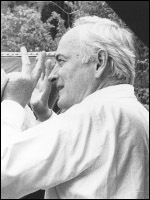 Since 1971, Merchant Ivory has made a number of films for British television, several of which have been shown theatrically. Autobiography of a Princess (1975) incorporates documentary footage of a vanished India into a wistful chamber drama, less than an hour long, featuring James Mason and Madhur Jaffrey . London Weekend Television provided backing for two arts-themed films which premiered on ITV 's The South Bank Show . Hullabaloo Over Georgie and Bonnie's Pictures (India/UK, 1978) echoes Ivory 's first Indian documentary in its wry comedy about attempts to acquire a set of miniature paintings from a Maharaja, while Jane Austen in Manhattan (UK/US, 1980) was inspired by a fragment of an unproduced opera by Austen . It was not until 1982 that the company established a permanent London production office, in preparation for Heat and Dust (1982), Ivory 's last, most complex and sophisticated Indian-set project. However, it remains based in New York, where Ivory , Merchant and Jhabvala all reside. The Europeans (1979), adapted from Henry James 's novel and made in New England with wholly British funding and a largely British crew, marked something of a watershed in Ivory 's career. Before it, all his films besides The Householder and The Wild Party had been made from original screenplays. Afterwards, all except Jane Austen in Manhattan and Jefferson in Paris (UK/US, 1995) were taken from books. Its success also marked the beginning of Ivory 's identification with period subjects. His subsequent literary adaptations, all among his best and most popular work, include two more from James ( The Bostonians , UK/US, 1984; The Golden Bowl , UK/France/US, 2000) and three from E.M. Forster ( A Room With a View , 1985; Maurice , 1987; Howards End , Japan/UK, 1992). These films are also more professionally finished than Ivory 's often engagingly rough earlier work. Perhaps as a consequence, Merchant Ivory now tends to be regarded as the cinematic equivalent of Crabtree and Evelyn or Fortnum and Mason: a provider of tasteful, exquisitely crafted, upmarket fare, but slightly dull and very definitely bourgeois. This is more than a little unjust. It is easy to assume that Ivory 's reticent, classically self-effacing style - camera generally kept at a discreet medium distance; priority given to performances and dialogue; a detailed but not florid mise-en-scène; a refusal to manipulate the audience's emotions - is merely decorative, dry or inert. But given sympathetic attention, the films are rich in nuance and suggestion; they are best seen on a large screen, not just because of their splendid fixtures and fittings but to draw the viewer in to their intimate observation of manners and unspoken desires. Eroticism is not absent from Ivory 's films, but tends to be depicted coolly, dispassionately. His characters may occasionally lose their sense of decorum; his direction never does. A careful restraint is placed upon excess, and he seems uncomfortable with the bohemian worlds of Picasso , Jean Rhys 's Quartet (UK/US, 1981) or Tama Janowitz 's Slaves of New York (US, 1989). This last, Ivory 's only film since 1980 with a contemporary setting, is perhaps his worst. His masterpieces are Mr. & Mrs. Bridge (US, 1990) and The Remains of the Day (UK, 1993), both ironic yet characteristically compassionate and non-judgmental studies of sexual repression.